Suds City Car Wash is committed to cleaning vehicles while also being environmentally friendly. When washing at Suds City Car Wash, your detergents and pollutants are trapped in a triple interceptor and then processed through an EPA Approved Oil Separator, instead of running into our waterways to pollute our environment. We also help the environment by recycling some of our water for reuse on site in certain cycles of the Automatic and for high pressure cleaning of the Manual Bays. Our recycled water is treated on site so that it is free of dirt and bacteria, making it safe for re-use. Waste materials from our car wash are disposed of in accordance to local, state and federal laws. 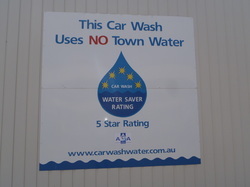 Suds City Carwash has recieved a 5 Star Rating, the highest Water efficient rating by the Australian Carwash association. To recieve such a rating Suds City Carwash successfully demonstrated our commitment to the environment and efficiency in the use and discharge of water.